Our last post looked at how a page developed from the script stage, through penciling, and finishing with inks. This time we will be looking at how a comic page goes from the inking stage, out to being a finished page with colours and words. I’ll stop delaying here and just get on with it. 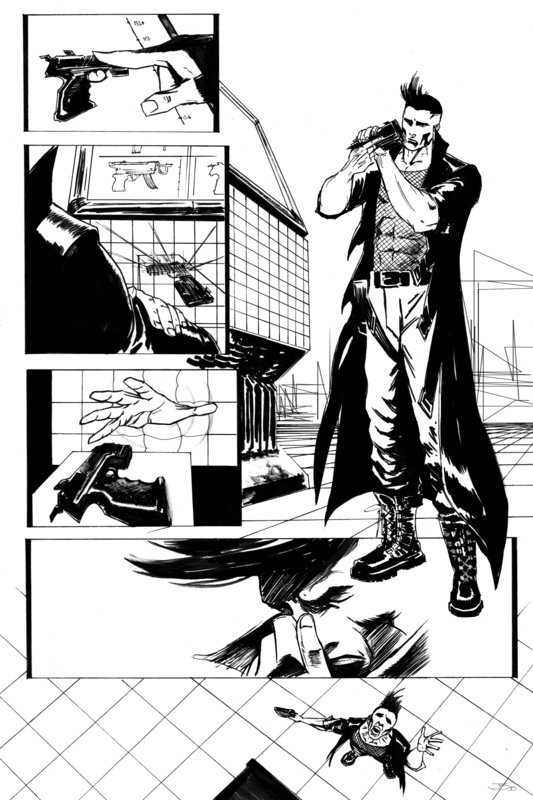 Here is what Josh’s inked page looked like before being sent to our colourist Gwen. All the main features have been highlighted, but now it’s time for a big transition as we jump to colour. Wow! And what a spectacular jump it is. You can see that Gwen really took the time to bring in different lighting, as well as incorporate a warm colour palette that really makes this technological world inviting. From the neon glows of the lasers in the vending machine to the sunset sky in the background. The amount of information that can be translated through adding colour brings an added depth to the page that really pulls the reader in. (6 Panels) We are now back in the present, and situated in some sort of wide open technology landscape. Panel 1: A close up on Sam’s finger as it touches a touch screen button. *TAP*. It mirrors the panel of Katie’s finger from the previous page. Panel 2: Over Sam’s shoulder we see what looks to be a very futuristic vending machine, that has numerous weapons being displayed on a video screen situated on it’s front. Below the video screen is a sort of receptacle that things would come out of the vending machine. Except this receptacle currently has a little laser show going on. The outline of a pistol is glowing in green data streams and it appears to float in this receptacle. Two lasers have already worked their way half-way up the handle of the pistol, with everything below the lasers now fully formed into the jet black handle of the pistol. Kind of like how a 3-D printer would work. The lasers make sounds. Panel 3: Sam’s hand now reaches into the receptacle. The lasers are gone, and the pistol sits there fully formed. Panel 4: We have now zoomed out from the pistol, and we see that Sam stands in front of this vending machine in a very Tron like grid area. The area is completely devoid of anything besides Sam and the vending machine. Sam is putting the pistol into the inside of his black long coat. He looks like he did in panel 5 on page 10, very well muscled, in excellent shape, 9/10 bangability. We now realize that Sam’s online form is based upon what he must of looked like when he was younger, with some added bulk to make him look more imposing. SAM: I’m aware… Thanks for pointing that out. DISEMBODIED VOICE: Not a problem. It is a vast improvement from what you look like in real life. Panel 5: A close up on Sam’s face. His two fingers pinching the bridge of his nose. SAM: Can we just get on with this? Finish loading me in. DISEMBODIED VOICE: Your HANDLER has requested you complete the tutorial first. Panel 6: Sam is looking up at the sky, there’s nothing there, but I guess if you are talking to a disembodied voice you look up. He is clearly pissed. SAM: Tutorial? No, No. Cancel Tutorial. DISEMBODIED VOICE: Tutorial sequence loading. Would you like to have it with extra exposition? DISEMBODIED VOICE: Extra exposition selected. 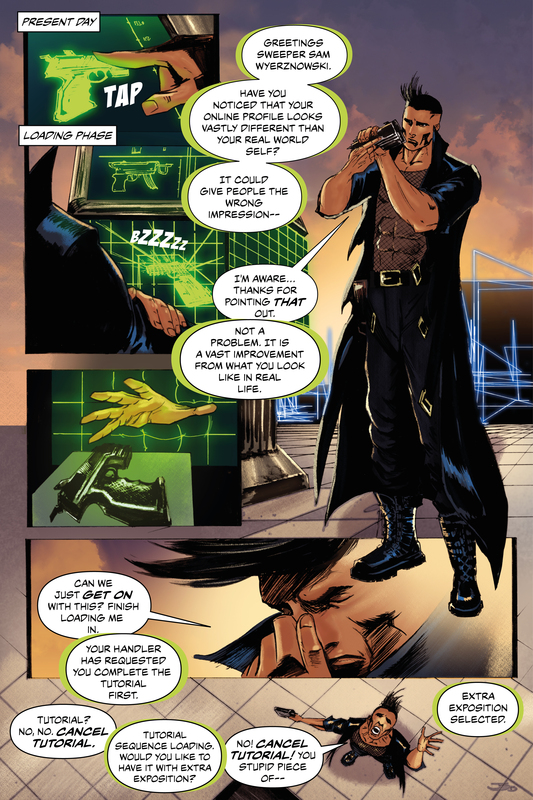 As you can see, Jamie has done an excellent job in placing the word balloons and texts to lead the eye around the page. The toughest part is getting our eye to follow the panels down the side of the page before going over to Sam. With positioning the caption boxes one on top of the other, this causes our eye to move vertically instead of horizontally, guiding us to view the 3 panels along the left side of the page, before transitioning over to the big picture of Sam. Jamie also uses word bubble overlaps to indicate how the Disembodied Voice is cutting Sam off, or speaking over him. If you’d like to see Hard Wyred come to life, than please keep an eye out for our Kickstarter campaign which will be beginning in… 5 days?!!! Wow! How time flies. Circle May 2nd, 2015 in your calendar and be sure to check back here for updates. 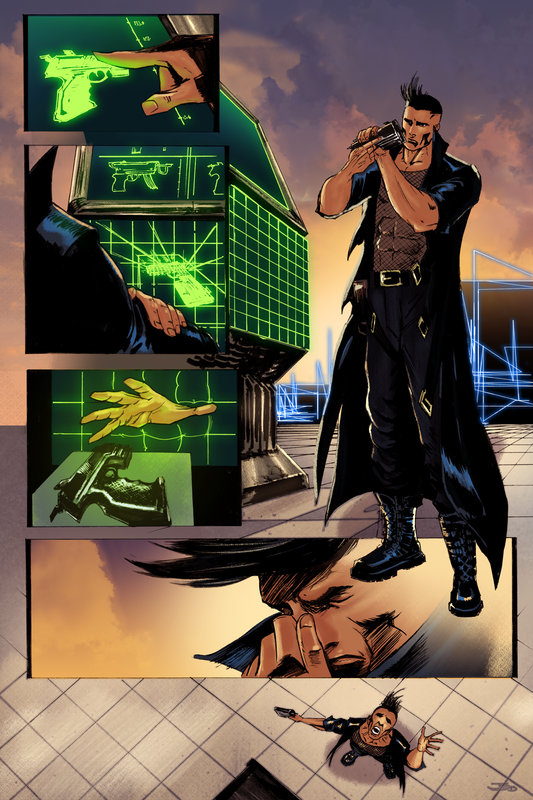 And if you would like to see some more of Gwen’s colouring work, check out her DeviantArt here. If you want to see more of Jamie’s lettering and his new comic called “Queen” check out his DeviantArt here. And lastly, if you want to follow Hard Wyred more closely check us out on Facebook and Twitter. Next We are Live on Kickstarter!